Once you have the basics of crocheting in the round you will be able to crochet a round rug in any style or colors you choose. 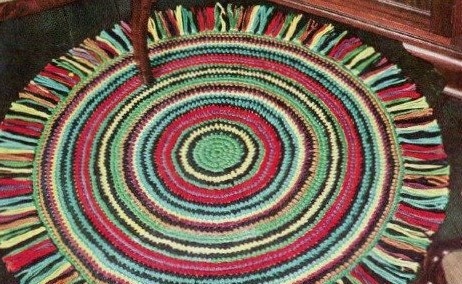 Most round crochet rugs start out with crocheting in the round and use a double crochet stitch. A larger crochet hook such as a size Q or P is preferred along with thicker yarn or holding two strands of yarn together. To Crochet a Circle you can either use a slip stitch to begin or a Magic Circle. If you choose the Magic Circle method please check on YouTube to find a video on how to make the circle it's pretty easy to do. Here is a formula that is pretty easy to do and you increase by every 12 rows (you can easily modify this for your rug). Note: sl st (slip stitch) in the top of the beginning ch-3 at the end of each round. Alternate making the increase in the first dc every other round. Round 1: Begin with 12 dc in ring. Continue increasing dc between increases until circle is desired size. If you choose to create your own rug using the above instructions you can do so by modifying your stitches and using the correct yarn and crochet hook. 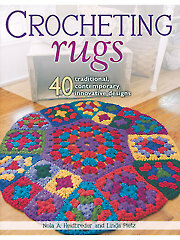 There are many patterns out there to crochet round rugs. They suggest using rags or fabric strips but a rug can easily be crocheted using thick yarn or two or more strands of yarn held together. Here are some patterns you may want to try. Wind all colors over a 5 inch cardboard, cut one end. 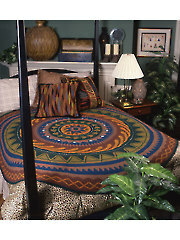 Using 3 strands for each fringe, double in half and knot through each s c around entire rug arranging colors as desired.